Yikes, last week was intense with a couple dud performances (Antonio Andrews, James White) among my value picks but also a couple huge hits (Michael Floyd chief among them). 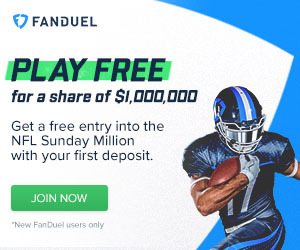 The season is winding down, but now is the time to play DFS as we have more information available than at any previous point during the season. Stay on top of your game, people! Fade players, not your know-how. With that in mind, here are my week 11 value picks for DraftKings and Fanduel, as always sorted by position. Absolutely bottom dollar and has now overtaken Nick Foles for the starting job. Keenum gets to go up against the worst pass defense in terms of fantasy points against. At this price, he’s very close to a must-start. Don’t love the Fanduel price, but I think Romo could put up huge numbers in his return to Miami. I think he’s a great start on Draftkings and don’t mind the price too much on Fanduel, though I think you could find better options on the latter site. Osweiler has great weapons surrounding him and is much more athletic and mobile than Peyton Manning - though hey, who isn’t these days? This is all to say that I can certainly see him performing better than the hall-of-famer he replaced, at least for the rest of the season. How can he only be 4500 on Draftkings? Oh yeah, no one but yours truly used him last week. After a ridiculously low ownership percentage against Denver, West finds himself again as a huge value on Draftkings. I’m using him everywhere. Last week was about one thing: how bad the Saints defense is. Consider me all aboard the Fire Rob Ryan train. Still, if Carolina has one semi-soft spot, it’s against the run. Washington certainly sees Matt Jones as the future and in what many will view as a tough matchup, I can see Jones making an interesting contrarian play. I think his ownership percentages will be low. I don’t care what their prices are, with Julian Edelman and Dion Lewis both now out for the season and against a very beatable Buffalo secondary, I think both Amendola and LaFell are fantastic plays. Quick saw 7 targets last week. He only hauled in one, but that was with the thoroughly inept Nick Foles slinging passes his way. I’m not sure Keenum is that much of an upgrade, but against (again) the league-worst Baltimore pass defense, I think Quick is a fantastic play, and I’ll definitely be using a Keenum-Quick stack in at least one lineup. Also, I think I just threw up a little in my mouth typing that out. 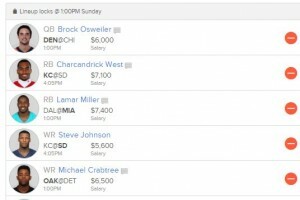 Speaking of DFS stacks, here are some more options for week 11. Philip Rivers has to throw it to somebody and last week that somebody was Stevie, who neted ten total targets. Ten. True, Kansas City’s defense has improved of late, but they can still be had via the air. Gimme some Stevie! Eric Ebron (3500/5400) is a good start against an Oakland team that struggles vs. the TE in what I expect to be a high scoring affair. Like last week, I also still like Crockett Gillmore despite his slightly elevated price. The Monsters of the Midway are back, baby! Last week, I loved the Bears DST value at only 2200 on Draftkings, and with only a 1% usage rate and now playing Denver, that price actually dropped! I’m not afraid of the matchup and the Bears have been playing well of late, which means yes, you can use both DSTs in this matchup. Crazy.